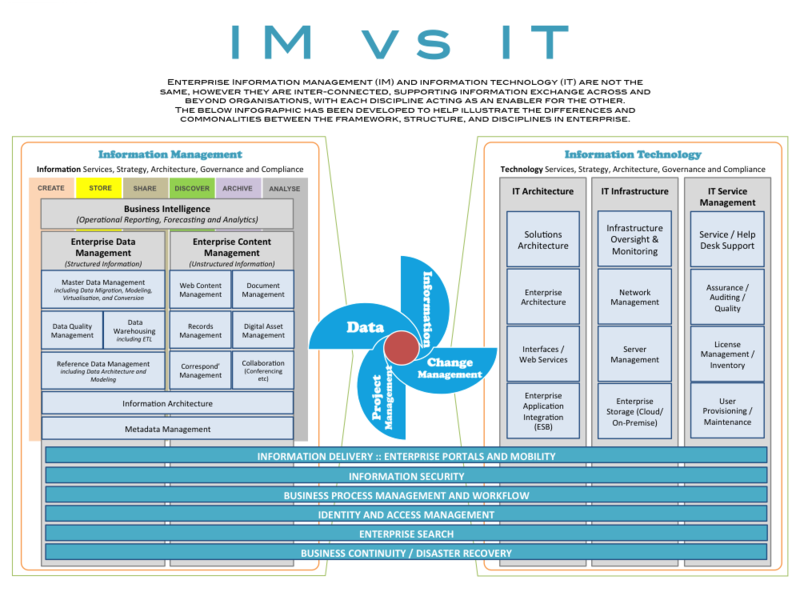 Enterprise Information management (IM) and information technology (IT) are not the same, however they are inter-connected, supporting information exchange across and beyond organisations, with each discipline acting as an enabler for the other. This post is cross-posted from a prior post to LinkedIn. As an information obsessed individual with a passion for infographics and information visualisation, I’ve endeavoured to address ongoing confusion around the distinction between information management (IM) and information technology (IT) by creating the below infographic. The infographic has been developed to help illustrate the differences and commonalities between the framework, structure, and disciplines in enterprise. The IM component in part draws upon an early framework part-originated by the incomparable Kaushal Mehrotra, while any faults with the IT component are all mine. While of course this view won’t match the views of all, it may prove a useful starting point for debate. We’d love to hear your views, with all constructive feedback welcomed of course!